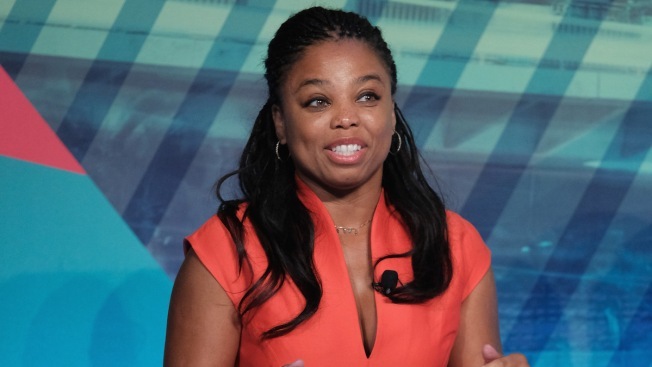 In this file photo, ESPN's Jemele Hill speaks at the "Why Are We Still Talking About This? Women & Sport in 2016" panel at 2016 Advertising Week New York on Sept. 29, 2016. The morning show "Fox & Friends" corrected by tweet a segment that described former ESPN anchor Jemele Hill as unemployed, but has not set the record straight on the air. The Fox News Channel segment on Tuesday featured another journalist criticizing the National Association of Black Journalists for honoring Hill as its 2018 journalist of the year. Hill received attention, and was briefly suspended from her role as "SportsCenter" host, for social media posts critical of President Donald Trump. Hill left the low-rated "SportsCenter" in January, but not ESPN. The veteran print journalist writes for the ESPN web site, The Undefeated. Fox guest Lawrence Jones, editor-in-chief of Campusreform.org, used the phrase "unemployed" three times in criticizing the NABJ's selection on "Fox & Friends. He said if he had a daughter interested in sports journalism, she could potentially look up to Hill. "Well, there is no Jemele anymore," he said. Three hours later, the show's Twitter feed posted a correction, saying Hill is currently employed by ESPN. There's no common practice for correcting mistakes on television. The idea of giving corrections the same prominence as mistakes is often discussed and, in this case, it's not known how many people who say the mistake on the air would be likely to see the correction on social media. A Fox News spokeswoman had no comment on the issue Wednesday. NABJ, through its president, Sarah Glover, said it does not need to dignify disparaging remarks made on the show. "But we do need to set the record straight: Ms. Hill is not only employed but thriving and advancing in her career in life," the association said. Hill tweeted: "Can't wait until my unemployment check kicks in."